Be met by our tour guide&driver at Tianjin Cruise Port, and transfer to the hotel of Beijing (about 3 hours). The rest of the day time is free. All of our arrangement’s today is in Beijing City. Pick you up from the hotel and drive to Tiananmen Square which is the largest city center square in the world can hold about a million people and then to the nearby Forbidden City, the imperial palace for twenty-four emperors during the Ming and Qing dynasties. After lunch, we are heading for the the best preserved imperial garden in the world—Summer Palace. Return to the hotel after the tour. Leaving the hotel in the morning and transfer to Mutianyu Great Wall which possesses unique characteristics in its construction. Besides, it is also famous for the breathtaking beautiful scenery. We will have lunch there and drive back to Beijing City to see Temple of Heaven, which was the venue for the Ming and Qing emperors to offer sacrifices to the Heaven and pray for harvest. We’ll take you back to the hotel after the tour. Our tour guide&driver will wait for you at the hotel and start our trip. Visit Hutongs which is one of the unique special features in Beijing. It has become a symbol of Beijing, in a degree, visitors from all over the world like to visit Hutongs rather than other modern buildings when they come to China. Then go to see Lama Temple, is the most handsome and impressive Buddhist temple in Beijing. Our afternoon tour is in Capital Museum. The Museum is a modern exhibition center with unique Beijing characteristics representing Beijing’s history, cultural relics and archaeological discoveries. After today’s tour you will be transferred to Beijing Airport and take a flight to Xian. Upon your arrival, our tour guide and driver in Xian will pick you up from the airport and transfer you to hotel. 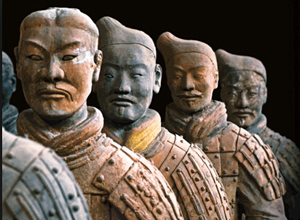 In Xian, we mainly visit 3 attractions– Terracotta Warriors and Horses, which are the most significant archeological excavations of the 20th century. The Big Wild Goose Pagoda that is built to store and translate Sanskrit Buddhist Scriptures that a monk brought from India and Xian City Wall which is one of the most famous attractions in Xian. We will take you to the airport safely for your departure. Hope you enjoy yourself!! !